Aladdin 'Al': I can't just stay in the palace! There's too much to do, too much to see. Q: So why did Jafar save Aladdin from falling over the waterfall? Not as good as Aladdin, but who cares? Rule number one in movie viewing friends: never, ever expect a sequel to be better that the original. because it usually isn't. 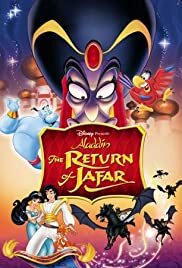 The Return of Jafar is no where near as good as Aladdin, but it is still generally good. This really wasn't even supposed to be a sequel. It was supposed to be the first five episodes of the animated series, thus explaining the change in animation. The story is fairly good and the movie has some good songs. And in defense of Dan Castellaneta, he does a good job as the Genie and sounds sort of like Robin Williams. Don't judge him just because of Williams' performance. It was not as good as Aladdin, but why would you expect it to be?